Raging wildfires in New Mexico forced the evacuation of the famed nuclear lab at Los Alamos Monday, though officials insist that radioactive material is secure. 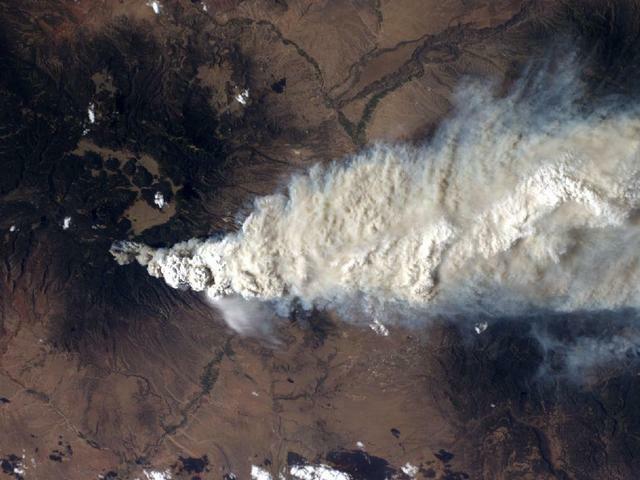 The pillars of smoke that can be seen as far as Albuquerque, 60 miles away, have people on edge. The fire has also cast a haze as far away as Kansas. But officials said they analyzed samples taken Tuesday night from some of the lab's monitors and the results showed nothing abnormal in the smoke. Anti-nuclear groups have sounded the alarm about thousands of 55-gallon drums containing low-grade nuclear waste - gloves, tools and other contaminated items - about two miles from the fire. Lab officials said it was highly unlikely the blaze would reach the drums, and that the steel containers can in any case withstand flames and will be sprayed with fire-resistant foam if necessary. Kevin Smith, site manager for the National Nuclear Security Administration, said the lab's precautions have been scrutinized by dozens of experts. The lab has been shut down since Monday, when all of the city of Los Alamos and some of its surrounding areas - 12,000 people in all - was evacuated. The fire has held up research on such topics as renewable energy, AIDS and particle physics. "We have 10,000 experiments running at the same time," said Terry Wallace, science chief at the lab. "We'll have to do an analysis to see what's been affected and how it's been affected." "The nuclear materials are secure," said Penn State University nuclear engineering professor Barry Scheetz, who has served on National Academy of Sciences nuclear review boards and has been to Los Alamos several times. "There's multiple redundancy in the protection of this material. It's not just laying out. It's not there so that a fire is going to disrupt it there and disperse it. The procedures that are in place to protect this material are tremendous." The worst-case scenario Energy Department planners could envision for a fire at Los Alamos would release less than 25 rems or radiation - a dosage that is below short and long-term health concerns, according to a 1998 Environmental Impact Statement for operating the lab written by the department. would release less than 25 rems or radiation does that even make sense, it would just be a burst of radiation? not particles that emit radiation for a long time wherever they go? around and around where they stop nobody knows. 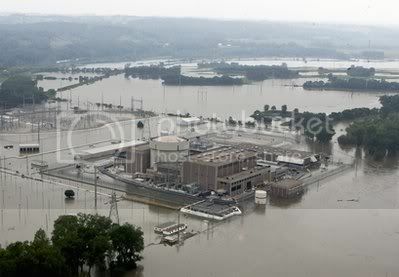 The Fort Calhoun nuclear power station in Fort Calhoun, Neb., currently shut down for refueling, is surrounded by flood waters from the Missouri River, Tuesday, June 14, 2011. According to numerous reports, the Omaha Public Power District (OPPD) declared a Level 4 emergency at the Fort Calhoun Nuclear Plant in Nebraska because of imminent flooding of the Missouri River. However the alert appears to have been withdrawn or disappeared. When you go to the OPPD site you see this notice released on June 6, 2011. "OPPD declared a Notification of Unusual Event (NOUE). This is the least-serious of four emergency classifications. OPPD declared a NOUE because the U.S. Army Corps of Engineers projects the Missouri River level will reach 1,004 feet above mean sea level later this week, and is expected to remain at or above that level for more than a month." Last message at Wed, 06/15/2011 - 02:01: Thanks very much Joe. Much appreciated. I followed your instructions and it seems straight forward. Thanks again :) Cheers by james. Total messages: 10. This follows on from NJT's post below and from Penny of “Penny For Your Thoughts” who has put up a piece on the killing of 120 Syrian police and servicemen in Syria. Penny makes some astute observations regarding the reports of this mass killing in the British newspapers and asks some pertinent questions. Many of the links in my post below come from Penny's article. We know that the BBC and the Guardian act as mouthpieces for the government and their security services. The Voice of America was overtly established as a propaganda arm of the US government, for goodness sake. So these reports (linked above) will be deliberately misleading, at least, in one way or another. Yet, of all the possible scenarios mentioned in these reports, the possibility that the gunmen are foreign military or security services trained personnel is never mentioned. The staging and success of these operations sound much more like special forces troops than "armed gangs". In the US, we don't hear much about these places, until people start dying violently. Syrian security forces intensified their assault on protesters calling for President Bashar al-Assad to quit, killing at least 34 demonstrators in the latest crackdown in the city of Hama, activists said. 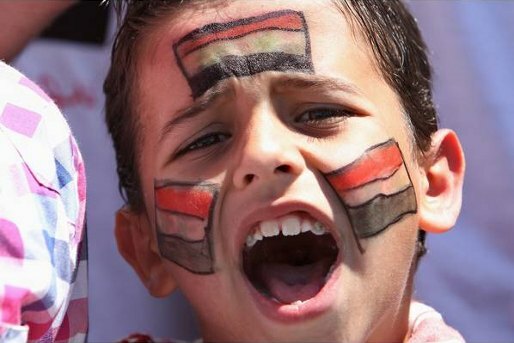 Thousands of protesters took to the streets after noon prayers on Friday in defiance of security forces determined to crush an 11-week a revolt against Assad's 11-year rule. Security forces and snipers fired at tens of thousands of demonstrators gathered in the city of Hama, where 29 years ago President Hafez al-Assad, Bashar's father, crushed an armed Islamist revolt by killing up to 30,000 people and razing parts of the city to the ground. Yemen's embattled President Ali Abdullah Saleh was wounded on Friday along with his premier and other officials as shells struck a mosque in the presidential palace compound, a security official told AFP. The mosque attack came as fighting that has killed scores of people in north Sanaa spread to the south of the capital and the poverty-stricken Arabian Peninsula country teetered towards civil war.